Although nursing has historically been a female-dominated field, its reputation as a “women only” profession is gradually diminishing. Even though the percentage of men in nursing is still disproportionately small (only between 9-10%) , because the nursing field is so wide open, more and more men are choosing this demanding, yet highly rewarding, professional path. A nursing career holds many advantages for men, such as highly diverse patient care environments, career stability, and a competitive salary. For men who are still deciding whether or not to answer the call to become a nurse, here are some great reasons why it’s a solid career choice. Statistics from the World Health Organization show that the total number of nurses actively working in the U.S. health care field has decreased dramatically since 2000, therefore causing the demand for nurses to increase. Another reason for the shortage is that our country’s aging population is generating a growing demand for services like end-of-life and long-term care. More and more facilities are actively recruiting men into nursing as a way of addressing this critical shortage of qualified nurses. Good nurses are in high demand, and will be for the foreseeable future. Men interested in nursing have already chosen to clear one hurdle: the gender stereotype. Once that is behind them, there are some compelling motivations for becoming a nurse. Many men value careers with relationship-oriented components, something nursing offers in spades. There is also a highly technical side to nursing, another element of the profession that is often appealing to men. Men who had early exposure to male nurses may also find themselves more motivated to break into this female-dominated field. Yes, there are barriers, such as gender stereotypes and lack of male role models, but with many individuals, these barriers have become an important reason to tackle them. Certain jobs have gender stereotypes attached to them, and nursing has always been one of them. Unfortunately, male nurses have historically had to fight a stereotypical image when compared to other career choices. Of course, there really is no significant difference in the actual quality of care a well-trained, compassionate male nurse can provide. It’s important for men interested in a nursing career to know that this is a valid and much-valued career choice. Those who choose this path will also find support in organizations like the American Assembly of Men in Nursing, which offers scholarships, conferences, collaboration, and coverage of nursing topics of particular interest to men. Even in the female-dominated field of nursing, male nurses typically out-earn female nurses, as is the case across almost all occupations. Another financial incentive for male nurses is that this is a solid and stable career field that shows no signs of slowing down. As a career, nursing is consistent and reliable as a career choice, and the retirement benefits are often very appealing. It is also not uncommon for new nurses to be offered sign-on bonuses. Even in today’s shaky economy, nursing is a reliable and financially savvy career choice for many. 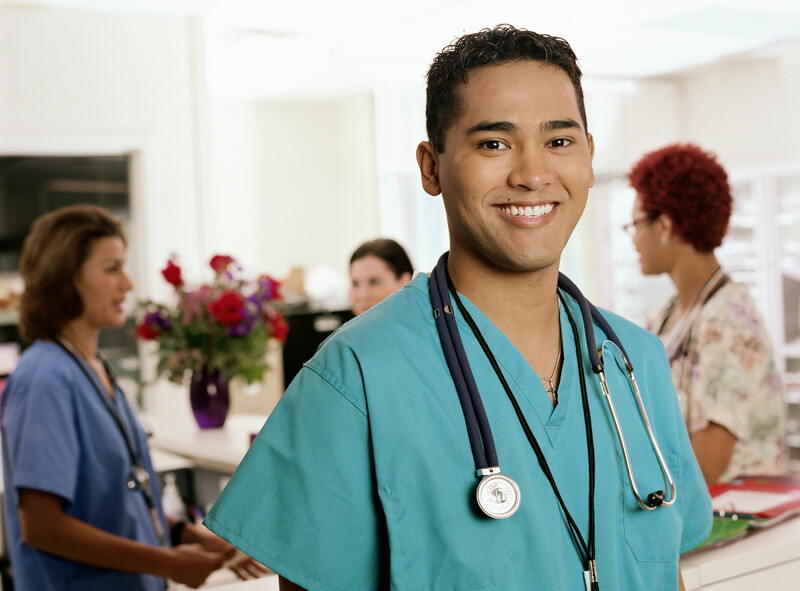 More and more hospitals and nursing schools are enthusiastically recruiting men to join the nursing profession. The need for well-trained, highly qualified nurses can’t be ignored, and men who are willing and ready to shatter the gender biases and stereotypes will often find themselves landing challenging, fulfilling, and financially stable jobs. Tyana Daley is a writer for University Alliance, a division of Bisk Education Inc. She writes about career related topics in the nursing industry such as, career advancement through online nursing programs and leadership courses.